Humans have been collecting and enjoying honey since ancient times. It has been used in many aspects of human lives, from being used as a sweetener to medical uses. Honey has left a significant impact on us, so it is widely used even today. We know that raw honey contains lots of good stuff (antioxidants, minerals, amino acids, and much more). Even though it has some benefits for our health, calories in honey are not negligible. We have to be wary of the number of honey calories, and the amount of honey we consume. Firstly, let’s take a closer look at what honey actually contains. Honey is composed of 76% sugar, 18% water, and 6% other components (minerals, proteins, vitamins, acids, essential oils). Sugar is the main ingredient and gives the honey its characteristic sweetness. Honey contains three kinds of sugar: fructose (41%), glucose (34%), sucrose (1-2%). The ratio of each sugar depends on flower source and enzyme invertase which breaks down regular sugar in fruit and grape. This enzyme is present in the flowers from which bees collect nectar, and some of it is present in bees body as well. About 3.68% of honey contents are minerals. Even though the percentage is not high, minerals make honey valuable to humans. Some of the minerals that honey contains are potassium, calcium, sulfur, sodium, chlorine, magnesium, and iron. 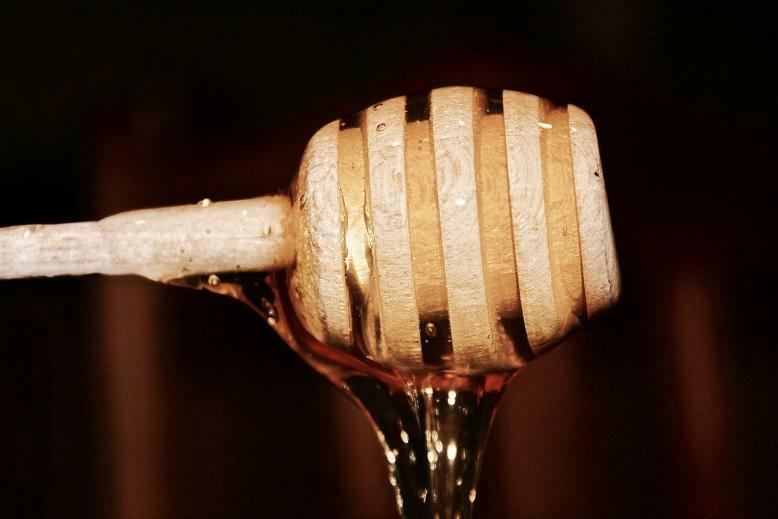 As a general rule, darker colored honey usually has more minerals than lighter honey. Honey contains many different types of acids, both organic and amino acids. Acids are mostly apple and lemon acid. The pH of honey is usually 3.9, but it can vary from 3.4 to 6. Proteins contained in honey come from pollen and nectar which bees collect from flowers. Vitamins are not present in content high enough to be sufficient for the needs of an organism, but honey contains some important vitamins such as B6, thiamine, riboflavin, and pantothenic acid. Essential oils give honey its characteristic aroma, and they quickly evaporate when the honey is heated. Read more: What to do when your dog gets stung by a bee? According to USDA (United States Department of Agriculture), 100 grams of honey has 304 calories. We can compare that to 100 grams of table sugar which has 387 calories. To have an even better visualization of how many calories honey contains, we can break down honey calories a bit more. Seeing the number of calories in honey you might wonder, why is it even recommended as a healthy option? For example, we can compare the honey and table sugar as sweeteners. We already mentioned that 100 grams of table sugar has almost 100 calories more than honey, which is a big difference. Also, table sugar is just pure sucrose with no benefits to your body - just empty calories. Watch out of the calories - moderation is the key! Honey contains many benefits for your body, but it should be taken in moderation. As a general rule of thumb, in case of a balanced diet, you should not have more than ten teaspoons of honey per day. Having too much honey can significantly increase your daily calories and result in weight gain. However, calories in honey should not turn you away from using it. Using honey as a sweetener instead of table sugar is recommended. Honey is denser and sweeter than table sugar so you will use less, and as a result consume fewer calories. If you are adding something to your drinks/meals, it should at least have some nutritional value which honey definitely brings. Even if you are not a fan of honey, try incorporating it into your diet. A daily teaspoon of antioxidants, nutrients, and energy might just be the boost your body needs. Read more: Honey color - what does it mean?